Five Thoughts on the biggest online buy-in event in history, Poker HOF, PokerStars changes and more! Five Thoughts: Whale hunted halted, hilarious HOF (and heater), fair warning and #JusticeIsBlinds. 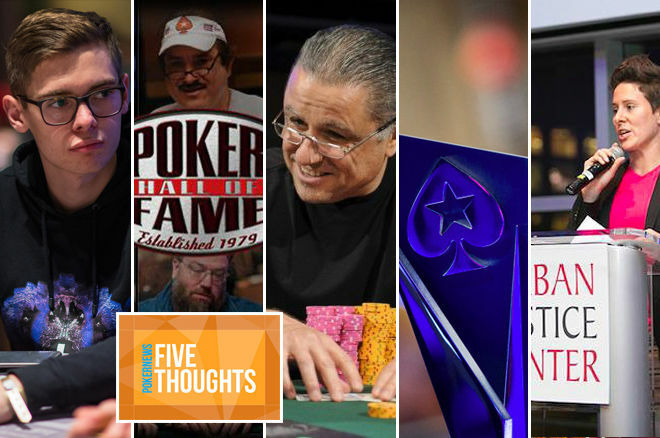 Much of the poker world spent the last week debating who should be in the Poker Hall of Fame Class of 2016. Some of the nominees got into the argument on social media, while at least one went to the felt to prove he's worthy. In the meantime, the biggest buy-in event in online history ended up being rather small, PokerStars finally gave fair warning that changes are afoot and Vanessa Selbst began gearing up for her latest charitable effort. The PokerStars World Championship of Online Poker $102,000 Super High Roller ended up being a bit of a disappointment last week. Most had expected the field to include up to 45 entries, but even a flurry of last minute registrants and a couple of reentries only brought the total up to 28. From the look of things, there seemed to be a distinct lack of recreational players willing to pony up the six-figure buy in, and without the dead money, a few high-roller regulars took a pass as well. Perhaps members of the affluent recreational poker playing community didn't feel confident playing for such a large sum online, despite a number of assurances from PokerStars' public relations and security teams that their money would be safe and the event's integrity kept in tact. Maybe Guy Laliberte is right, and they've become tired of being the fish to the percentage-swapping pro sharks, or perhaps they simply didn't feel like making another donation to the Fedor "CrownUpGuy" Holz retirement fund. One high-roller trend certainly continued, as Holz moved farther along the path of poker's greatest heater, becoming one of two players to book seven-figure scores in the event, after a chop with eventual winner "bencb789." Only time, and registration numbers in any upcoming high roller events on the live circuit, will tell if there's any new trend developing here, but Holz may want to be a little careful going forward. In fact, it might be time he consider giving a little back, because if he keeps winning high rollers at this pace, the whales won't be the only ones who decide to quit him. Poker Twitter heated up this week with some serious debate about the latest list of nominees for the Poker Hall of Fame and the criteria for induction. Of course, Hall of Fame member Daniel Negreanu added his two cents and more to the discussion, blogging about nomination snubs, induction criteria and whether or not those on the current list of nominees meet them. But it was the less serious side of things that wound up being the most entertaining, as a few of the nominees began a tongue-in-cheek campaign for induction, debating the issues as if they were on the U.S. presidential campaign trail. The back and forth was hilarious, even if things did turn a little serious again when Pescatori got into it with Negreanu over Kid Poker's thoughts on who should be inducted and why. It remains to be seen if any of these three will be inducted this year, but one thing is for sure: They're worth the follow on Twitter no matter what happens. After being nominated for the Poker Hall of Fame for the first time, high-stakes cash game legend and three-time World Series of Poker bracelet winner Eli Elezra has suddenly emerged as one of the hottest tournament players in poker today. It all started when Elezra booked his first-ever WSOP Circuit cash, finishing runner-up to Sean Yu in the WSOP Circuit Planet Hollywood Main Event in Las Vegas for $105,281. It continued when Elezra managed a sixth-place finish in the Venetian DeepStack Extravaganza $3,500 $1 Million Guaranteed for $46,000 a week later and then boomed again at Borgata in Atlantic City this weekend. During a tournament series that included the PokerNews Cup and World Poker Tour event on the property, Elezra booked a win in the 449-entry $350+$50 Saturday Series Deep Stack NLH $100,000 Guaranteed event for $34,156. There's no guarantee Elezra will be inducted into the Hall of Fame this year, but he's certainly making a good argument in the "stood the test of time" category with this latest run. PokerStars will be rolling out some changes to its rewards program in 2017, but what they are and when they're coming remains a bit of a mystery. Outside of a few vague details including the fact the rewards will now be offered across the company's poker, casino and sportsbook verticals, and go monthly instead of annual, this latest announcement was simply a warning that the changes are coming, particularly to the site's Supernova level rewards program. When major changes were made to the rewards for PokerStars' highest volume players last year, they came at what seemed to be the 11th hour and with little public warning. It was a bit of a public relations nightmare for the company that ultimately spurred on what appeared to be a rather ineffective boycott from a small group of high-stakes players, until now. Supernova players may not have been able to save the rewards they were expecting to earn last year, or even hold on to the ones they have now, but all the fuss they made has PokerStars sending out advance warning this time around, at the very least. Vanessa Selbst will be doing her part for her hometown of New York City next week, when she once again hosts a charity poker night to benefit The Urban Justice Center. The Justice is Blinds event promises to be a star-studded night of poker, food, cocktails and fun featuring some of the biggest celebrities from the world of poker, entertainment and sports. Daniel Negreanu will be joining Selbst in hosting the event, which drew almost 200 attendees last year, raising $160,000 for the nonprofit group that provides legal services to the New York City's most vulnerable, including street vendors, domestic violence survivors, international refugees, veterans and the homeless. Celebrities already planning to attend the Sept. 27, 2016 event at the Capitale event center include Hank Azaria, Billy Crudup, Eric Bogosian and Rounders writer Brian Koppelman. Poker Pros Olivier Busquet, Stephen Chidwick, Melanie Weisner and Jonathan Little are also expected to be there. When it comes to the poker portion of the evening, players will be competing for prizes that include an $11,000 PokerStars Championship Bahamas package, hotel and airfare to anywhere in the Continental US and tickets to an NFL game at Metlife Stadium, including four pregame field passes.